Currently, I provide three major services at standard rates: beta reading, copyediting, and proofreading. While I’m willing to do other tasks like fact checking or developmental editing, those are negotiated on a case-by-case basis (due to time involvements) and thus have no fixed rate. To see if I’m the right fit for you, I will provide a complimentary edit of the first two chapters or 1500 words of your work, whichever you would prefer. I use Microsoft Word to track changes and provide comments, though other options are available upon request. 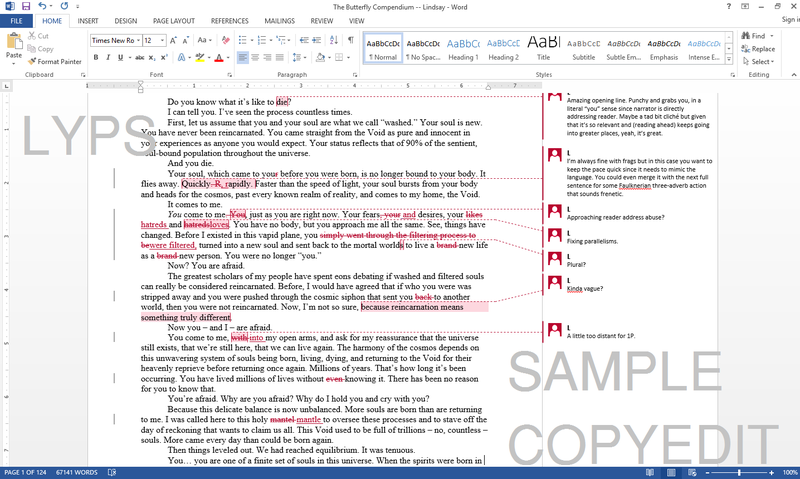 Here’s a sample of my copyediting work, for an urban fantasy novel. Though I personally read romance, science fiction, fantasy, and literary fiction the most, I will read and edit any type of project from any genre, including those with mature and/or graphic content. I’m also happy to work with nonfiction projects, since I have a substantive background in academic research. As it varies from editor to editor, below is a rundown of what you can expect from me as editor should you choose to use my services. One complete read-through of your work, acting as reader rather than editor. I provide feedback on characters, how interesting the narrative is, what I think works or doesn’t work, and other reader response concerns. One complete read-through of your work plus a quicker second pass, focusing on technical concerns only. I provide grammatical corrections, resolve spelling errors, and be mindful of consistency, but will keep deep edit concerns to a minimum. Plot and characterization are not addressed with this service, so this is recommended only for mature manuscripts. I also provide proofreading for previously published works. Two complete read-throughs of your work, with a universal focus, including grammar and correctness, readability and natural-sounding language, internal consistency, and engagement with plot and characterization. As this combines proofreading with line edits, this is a more extensive service where I engage not just with technical aspects but also the ideas at play on the page and in the larger narrative. As a person who loves to read, I recognize the importance of an author’s voice. My goal is to preserve your authorial voice while making sure a piece sounds natural, in-character (or stylistically consistent), and engaging. I provide suggestions and alternatives but, as always with editing, it is up to the author if they’re used in the final manuscript. For any project that I’ve read in its entirety (which all of my services currently entail), I will be happy to compose a test blurb or consult with the author as a proofreader and sounding board for the blurb you’ve written. Composition is $10 and consulting is free, and can be rolled into your invoice with your other services or billed separately. If anything above interests you, click through to see my rates!